Home → Festivals → Few unknown interesting facts about the Pongal festival. We all know about the Pongal Festival, why it is celebrated, its significance and we also know the different types of Pongal festival. (if not please check the links). Here in this post we like to reveal a new horizon about the Pongal Festival. Read thro’ to know more. 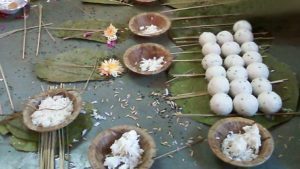 This year (2018) the Pongal festival is celebrated on 14- Jan-2018, Sunday. When Lord Surya travels towards the North direction it is known as the Uttrayana period. The pongal day is known to be the first day of this uttrayana period. We all are aware of the fact that without the Sun god, there is no light for Lord Chandra, the vegetation would not prosper, evaporation would not happen and in turn rains would fail. This is why we offer vegetation like sugarcane, turmeric ginger, rice and plantain that are grown on the land. People draw a chariot like rangoli, paint it in kaavi, make pongal with new rice and offer it to Lord Surya, who is the core reason for our prosperity. Lord Surya is considered as an incarnation of Lord Shiva, Surya is also known to be the right eye of Lord Shiva, Vishnu and Shakthi. The various climates that prevail in the world are possible only because of the rays of Surya. Here is a beautiful comparison between Lord Surya’s chariot and the Time (minutes, seconds, year and months). Lord Surya’s chariot has one wheel (Chakra), 12 spokes, 7 measuring scales of the Vedas and 7 Horses. The 7 horses represent the 7 days of the week, the twelve spokes represent the 12 months of the year. In the chariot there are 60,000 rishis who are the size of the thumb finger (Valakilyar rishis). They represent the 60 nalikai of one day. (1 nalikai equals 24 minutes). 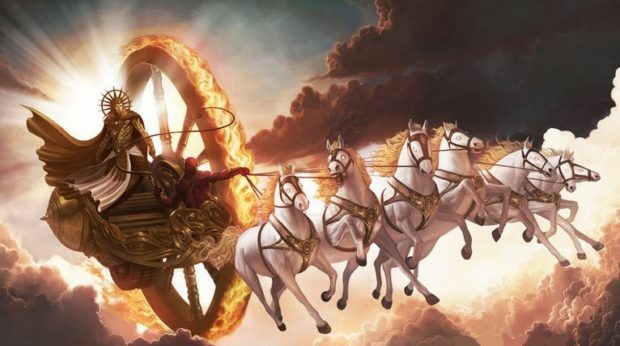 The upper part of Surya’s chariot’s wheel is known as the utthrayana, the lower part is known as the Dakshanayana. Hence Lord Surya who is a representative of time and Veda is known to be an incarnation of Lord Shiva, Vishnu and Brahma. It is very auspicious to worship lord Surya on the Pongal day. When worshipped by performing pooja, reciting the Aditya hridayam, Lord Surya bless his devotees with good health, Long life and peace of mind. Today is the best day for couples to be initiated into chanting the Surya namaskara mantra from a satguru. 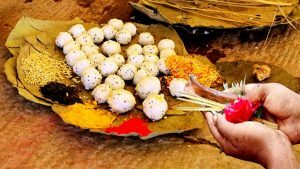 Interested in knowing the time when Pongal paanai must be placed, Kakaiku kannupidi time and other auspicious events of this day?